Tourist attractions in Bali GWK , maybe you ‘ve heard or indeed you ‘ve been to this attraction in Bali ? Yes or no , it helps you read this web page , for those of you who may have not had a holiday here can give you a brief overview of GWK Bali . To go to the location of attraction GWK Bali , there are a lot of ways . Maybe with a taxi and ask the taxi driver to take you or with your own driving a vehicle . Everything you are decisive , because it is best for you , only you know . A little wiser today , the authors advised lonely anymore … he .. he . Bali car rental with driver is the best way for you to vacation at GWK Bali , but yes this is what we are determining your back . You do not need to think to look for a parking spot and usually at GWK tend parking lot is full , especially during peak season . Bali – GWKPada when you ‘re done enjoying the entertainment at tourist attractions in Bali GWK , you can directly contact your driver , to pick up on where you want to get out of the Garuda Wisnu Bali . Much fun and more comfortable than the rental car without driver . In addition to ordinary cars , we also provide Bali Limousine for rent during your vacation in the pedestal or other interesting sights , we provide luxury cars such as the Corolla car rental in Bali . 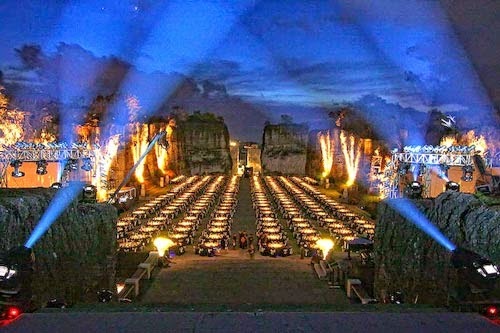 GWK – Stands of Garuda Wisnu Kencana , symbolized by the god Vishnu statue that stands on the hill Unggasan . Statue of Lord Vishnu has a height of 20 meters . In this GWK sights , visitors can enjoy views of the sunrise and sunset. Statue of the god Vishnu , was built and carved by famed carver named Nyoman Nuarta . Not only the beautiful scenery that you can only see in the tourist area of ​​the pedestal , where this tour also offers a wide range of entertainment events from morning till evening . Schedule of entertainment events at GWK , you can see below.